Energizing formula that can stimulate hair growth. 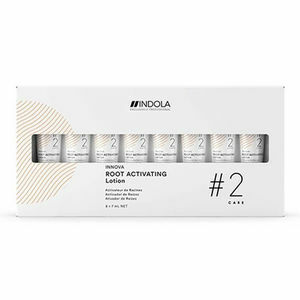 Indola Innova Root Activating Lotion represents step #2 in the Indola Innova Root Activating hair care programme. It uses Trichotherapy Cosmetics’ energizing formula to stimulate hair growth, bringing the proportion of active hair roots to a near normal level of 80% after 24 weeks of application. It reduces hair loss after 6 weeks of continuous use when used in combination with Indola's Root Activating Shampoo and increases hair density after 24 weeks of continuous use. Please note that these results refer to non-pathological hair loss and were observed by 75% of participants in clinical study (independent German Dermatological Institute 2007, with 60 participants). It also features hydrolysed keratin within the formula to keep your clients' hair in great condition. Available in a pack of 8 x 7-ml tubes. £16.02 (inc. VAT) Why no VAT? We're a trade wholesaler and quote our prices without VAT to help our VAT-registered customers understand the true cost of a purchase. Gently cleansing shampoo that uses taurine and carnitine to gently cleanse and stimulate roots, helping to strengthen hair. Available in a 300-ml bottle.